Look for games that have more than one level or stage. Children have different skill levels and in order for a game to be more than just entertaining it needs to provide kids with a manageable challenge. Kids need to think in order to boost their brain power. Choose interactive games. A game that is interactive is exciting for a child to play because it makes them an integral part of the experience as it is dependent on the choices they make and the actions they take. These types of activities automatically help to improve a child’s hand-eye coordination skills and thought processing. In essence, make sure the free online learning games you pick are quality educational tools. This can be found out with a little investigating. Just a short note to welcome my dad home today. Yes, my dad finally received a green light from the doctor yesterday allowing him home this morning. I was delighted to receive this good news from my brother upon arriving home yesterday evening. Everyone show a sign of relieve, popping in and out of the hospital is over for us after a week, seems like a long week. This morning, brother Alfred, happily getting ready to fetch my dad from the hospital. I am sure there are some waiting to get the discharge paper work done in the hospital, payment and collection of medicine from the pharmacy, my father will only be home around noon time. Now it's time to get ourselves ready for Christmas! I baked a birthday cake 4 days ahead of my birthday simply because my birthday falls on a working day, I would have no time to decorate the cake, I just want to relax and get myself ready for a birthday dinner at Pizza Hut right after I get back from work today. My girls wanted to help me out on the cake. They did a good job though messed up a little. 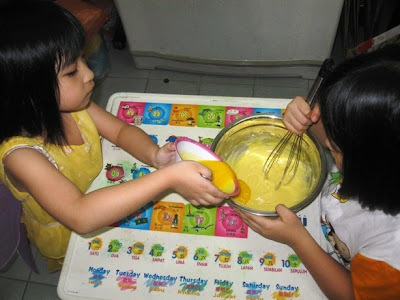 They are picking up the skills while I am pursuing my quest in baking and decorating cakes. This is a Chocolate and coconut with peach layer sponge cake. A combination of chocolaty and tropical flavour in one, decorated with gum paste flowers. The cake is moist and soft. Recipe here. 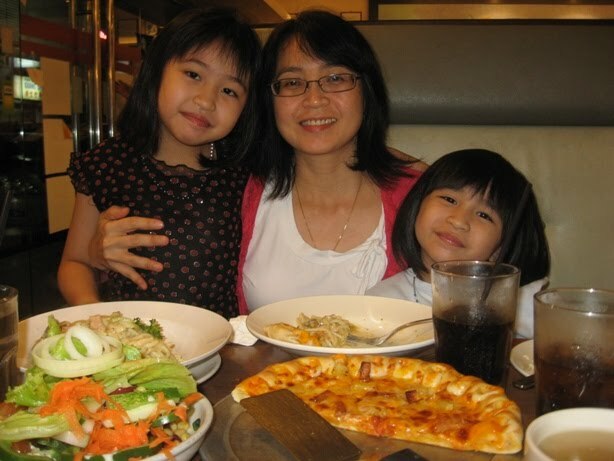 We chose to dine at Pizza Hut because my girls love the food there, I like it too!! 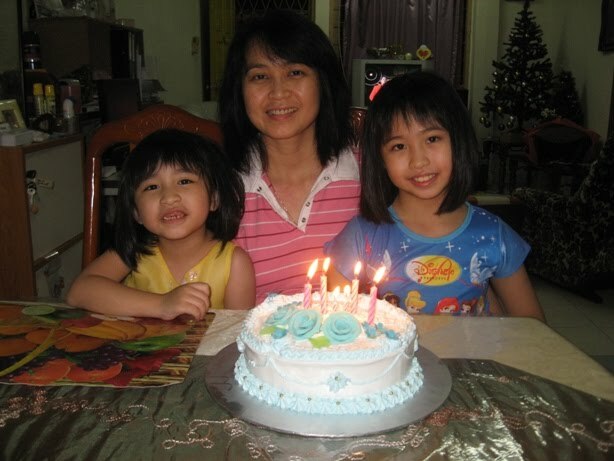 My birthday is celebrated in a quite way, as it has always been, only the four of us. I am touched with lots of birthday wishes coming through to my sms and Facebook till the last half an hour of my birthday today, I really appreciate and thank all of you, my friends and cousins, for your thoughtfulness and taking the time in sending me your birthday wishes. 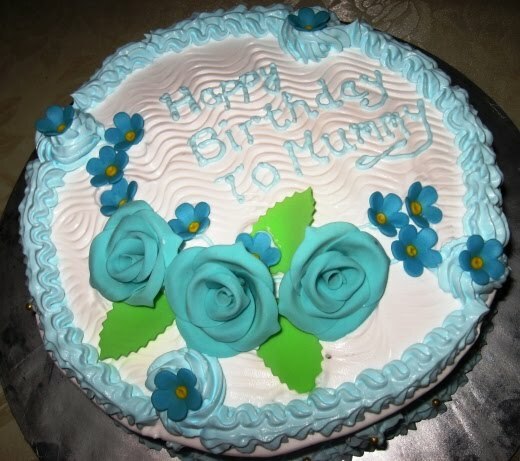 Thanks once again and looking forward to many more birthday wishes from you in years ahead.